If you are 40 lbs overweight, take one TruChocolate and one 8 oz. water. If you are 40 to 99 lbs, take two TruChocolate and 2 water. If you are 100 plus lbs overweight, take three chocolate and 3 water. You may think, how can I lose weight eating all that chocolate and drinking all that water? I don't know, but everyone that is doing it right is losing a ton of weight. Chew slow, enjoy the taste, sip the water and luxuriate in the flavor. What is bringing people to the this fountain of knowledge, weight loss and money is so simple, Taste Buds and Testimonies. The secret to a fortune is to add your testimony to this growing list of success. There have never been as many people in such a short time as there are now, breaking Diamond and Double Diamond. 1/3 of all the Youngevity business is TruChocolate. 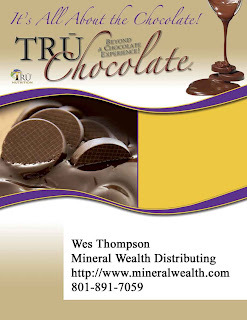 There is a webinar most nights at 7:30 mountain time, www.truechocolatewow.com. Check it out! This is so easy to make tons of money. My id is 16607501 and you can sign up at www.mineralwealth.us. If you were sent by someone else, use their number. If you are already one of my team, go to work for your dreams. This doesn't take much time, effort or brain power to know that this is the time to be working your plan B very hard. Things are nasty and Chicken Little is losing his head. Be one of the ones that are prepared when the sky falls and have an umbrella that will stop it from hitting you and your family. The other thought is with huge pollution, everyone, even the skinny people need the antioxidants in this product. If you need to lose weight and if you hear Leno most everyone but him is on that list, give it a try and add your name to the testimonies that have seen TruChocolate do it's thing. If you need a quick fix and aren't sure call 1-512-404-1282 and listen again. I am excited because this train is moving on and people are stuffed on board. Don't miss out and be the one at the station that missed the train. Chocolate with Benefits! Earn Now! I maybe left the TruChocolate up a little longer than I should have but I feel this is very important! *I hope you get it from the post: an 11 year old company with over 450 products brings on a new product and it explodes their business. TruChocolate is now 1/3 of the business of Youngevity. How do "YOU" make a ton of money with TruChocolate? First; if you aren't doing Youngevity, pay your $10.00 and join the team. http://www.mineralwealth.us/. If you are, congratulations! Second; order a qualifying order (1x-300+ BV) of TruChocolate (Why? If you are qualified you will get 30% return on up to $750 on all your new associate's first order. You and they need samples to make this work. It works! Third; visit friends and hand them a TruChocolate and say "Try it." Follow up with a cold bottle of water and wait for the "WOW!". It's that easy! Fourth; on your cell phone call the testimonial number, 512-404-1282 hand it to your friend. Fifth; Help your friend join your team and make the first order. It is so Duplicatible. This product is very effective! Lose a pound a day! I have been using it and from my high point I’m down 33 lbs. Is weight a problem? Just look around. Protect yourself with huge antioxidant properties (3040 ORAC per piece). Nothing else even comes close. Salt Lake has horrible SMOG! Antioxidants give your body the amunition to fight the effects of pollution. This is a fork in the road. You can choose to get on board the train and go to the top or, like an old dog laying on the porch with a nail under his belly, you can lay around in pain and watch the train go by. Please, we want you to succeed with us. Get on board now! Wow! Youngevity ~ New, Bigger, more MONEY! I was on a Youngevity conference call and heard that TruChocolate is going nuts! With a huge company and 450 products, with thousands of distributors and users, can you imagine a business coming along and becoming 1/3 of the sales in Youngevity in 8 months. Wow, I am out of breath saying and reading and thinking about how incredible that is. Imagine the highest pin level, Triple Diamond. It has been a very lonely position for a long time and it took years to reach for our leaders, Todd and Blake. Imagine the Capadonas reaching it in under 8 months. Triple is a million dollar position. They are breaking Diamonds every month. Diamonds make money! This is awesome. So what are they doing? This is very duplicatable! All they are doing is ordering bunches of TruChocolate, letting friends try TruChocolate, and teaching them to do the same. When your friend eats the chocolate and drinks a large glass of cold water they will experience the WOW factor. WOW is when they can’t believe how pleasant it is to be on the way to losing a pound a day and to do it by eating Chocolate that is really good! So, they eat TruChocolate and then you call the magic number 512-404-1282, put the phone to their ear and let them hear the testimonies. They will want what you have! Also there is a system of Webinars and conference calls listed on the Youngevity Website. This information is very motivating and further explains the system. From there, the $10 bucks for your new associate is the last thing on their mind. People all over the country are busting it to get into this system. Steve and Doc also wanted to make it better for us and all these people. There has been some adjustments in the compensation plan. GREAT NEWS FOR ALL QUALIFIED ASSOCIATES ~ Coming Soon! Earn up to 30% (26% +1/2 normal commissions) Quick Start Bonus on up to 750 PBV! Full commissions going upline uni-level commission payout after initial month of Quickstart Volume. Full commission's going up line sooner will result in bigger checks being paid faster than ever, encouraging quicker duplication! · In a continued effort to not raise prices, the three and 5% personal purchase rebates have been discontinued, the 7 and 10% personal purchase rebates remain in place. Prices will remain the same for now what no projected price increases at this time. · Free sign-up for preferred customers remains in place! · Free shipping on all autoships over 50 BV! · Free basic website when you sign up! · We have no annual fees! GREAT NEWS FOR QUALIFIED DOUBLE DIAMONDS! All qualified Double Diamonds will now have Kona Double Diamond status and receive a $600 dream bonus (that's $100 raise!). All qualified Fiji Double Diamonds will receive a higher dream bonus in the amount of $800. They'll also receive a new 4% seventh level payout in addition to the 2% leadership bonus for a total of 6% on level 7! GREAT NEWS FOR QUALIFIED TAHITI DOUBLE DIAMONDS AND QUALIFIED TRIPLE DIAMONDS! All qualified Tahiti Double Diamonds and all qualified Triple Diamonds will receive a new 4% seventh level payout and a new 4% eighth level payout in addition to the 2% leadership bonus for a total of 6% on level 7 and an additional 6% on level 8! There have been no significant compensation plan changes in the past 12 years. The current economic uncertainty has a silver lining for all Youngevity Associates! There has been a significant increase in people searching for a viable business opportunity! This is a once-in-a-lifetime opportunity and prime time for you to show people how they can improve their health and their finances. With 10 million unemployed Americans and 350 million concerned about their financial future, Youngevity is poised and ready to meet this huge opportunity head on! We have the infrastructure, the products, the compensation plan and we have Dr. Joel Wallach, the pioneer of nutritional supplementation and the founder of this great company. Now, more than ever before... Youngevity is the RIGHT COMPANY with the RIGHT PRODUCTS and the Right Compensation Plan at the RIGHT TIME! The FDA and the FTC have not approved this message. It is your responsibility to look over the materials, try the product and make up your own mind what you can do with these products and this opportunity. January, fresh as new snow! So what? January is the virgin month. We have a clean slate and what are we going to do? I suggest a new vision board. You’ve all seen The Secret. Yes/No? Well if you haven't you need to go to Google and look it up. Find out about it and do something to improve your life and the lives of those you love. We all sit around and wish for something better; better job, house, health, body, car, lifestyle, friends, family, church, town, state, country. What ever it is that you long for, it is only a wish unless you do something to get it. I believe in vision boards. I think if you imagine what you want by visualizing it and getting emotional about it, you will get it. So get a blank piece of poster board and some magazines. Cut out pictures that represent those things you long for. Stick those pictures on the poster board. Put that sucker somewhere so you will see it all the time. Bob Proctor said the other day you should also have a card in your pocket with what you want on it. Every time you reach in your pocket you can pull it out and get emotional about having the things you want by reading the card. Everyone will have different things which motivate them. Mine are mine and so on. What we will do in order for those things is more universal. We will work! I am not sure what you do to work. I like Network Marketing. I am so excited about the new product, TruChocolate in Youngevity. People are losing weight. I am losing weight. It has an ORAC of 3,040. If you know anything about anti-oxidants you know that is the highest out there. Go to your website or go to mine at www.mineralwealth.us and check it out. Just click TruChocolate on the left side of the home page. Sam, I Hope You Like The New 2009 Look! It's a new year and I'm up for a new look and so is my blog. I hope Sam, my daughter, likes the layout and colors. I went through tons of backgrounds and didn't see what I wanted. Everything is either to frilly or to dark. I really like a blog or website that reading the font is easy. The ones that drive me up the wall are the black background and the grey font. It's cool to be the Matrix or Twilight but it makes for very hard reading. 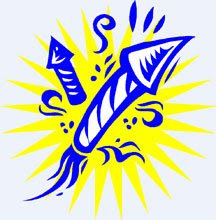 I probably put more content about Youngevity than I should but my blogging goal is to help you understand what a great company you are aligned with. I hear so many times that people can't keep up with the new products. My intention is to stir your interest to look at the information on your own website. You will find out how much your life can be blessed by using Youngevity products. I'm sure you've heard my story. I know I would be dead without these products. I understand most of you came in for what ever interested you when you signed up but this is an evolving company. If you keep up with the new offerings and also whatever brought you to the table, it will really suprise you how easy it is to qualify for a check. Just change where you buy not what you buy. Your budget won't be hurt. Just think about it, you can be someone who gets a check and all you have to do is use great products. I bet when you have a life altering experience many people will ask what you did. I know that happened to me. All you have to do is tell them your story. Don't go on a crusade and dump all over them. Let them pry what you are doing out of you. I am so excited about this year. Hook up and follow my blog.